Klasik Nasional FM is National and Oldies radio station in Malaysia. It was launched 1946 in Singapore then divided into two parts after the independence of Malaya. 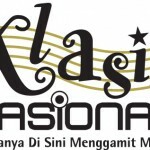 Klasik Nasional FM starts their regular transmission January 1, 1959. The station become too much popular in a short period of time. It airs a lot of fresh music, old songs and pop music on a daily basis and share positive knowledge Specially, youngsters like their late night programs with funky gossip with your favorite RJ,s in all these cool and spicy programs and keep always yourself up to date about local News updates. In general, music of Malaysia may be categorised as classical, folk, syncretic (or acculturated music), popular and contemporary art music. Classical and folk music emerged during the pre-colonial period and exists in the form of vocal, dance and theatrical music such as Nobat, Mak Yong, Mak Inang, Dikir barat, Ulek mayang and Menora. The syncretic music developed during the post-Portuguese period (16th century) and contains elements from both local music and foreign elements of Arabian, Persian, Indian, Chinese and Western musical and theatrical sources. Among genres of this music are Zapin, Ghazal, Dondang Sayang, Mata-kantiga, Joget, Jikey, Boria, Keroncong and Bangsawan.